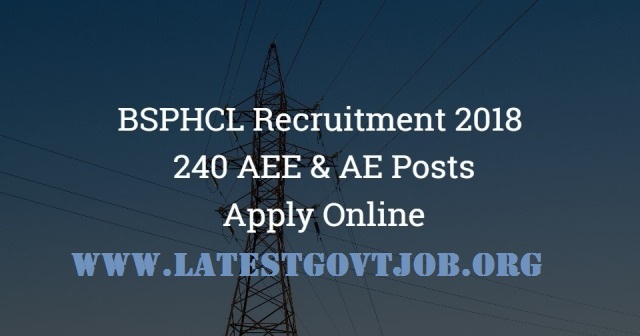 BSPCL Recruitment 2018 For Assistant Engineer Civil & Electrical 240 Vacancies | Apply Online @bsphcl.bih.nic.in : Bihar State Power Company Limited (BSPCL) has released a notification for the recruitment of 240 Assistant Electrical Engineers and Assistant Engineers (Civil). Interested candidates may check the vacancy details and apply online from 16-03-2018 to 31-03-2018. For Assistant Electrical Engineer: Candidates should have passed 4-year Engineering Degree in B.E./B.Tech./B.Sc. in Electrical/Electronics with 60% marks from a recognised AICTE university/institute. For Assistant Engineer (Civil): Candidates should have passed 4-year Engineering Degree in B.E./B.Tech./B.Sc. in Civil Engineering/Construction Engineering with 60% marks from a recognised AICTE university/institute. Note: Candidates should have passed GATE Exam. Selection of candidates will be made on the basis of GATE Score Card. Interested and eligible candidates may apply online through BSPCL website - http://bsphcl.bih.nic.in/ - from 16-03-2018 to 31-03-2018.